The sheer number of strategic initiatives and technologies in the banking industry makes it very difficult to predict outcomes with any certainty. Not that me or other industry pundits don’t try. I have been noticing some trends that are providing insights on our direction, evolution, and ultimate picture of our future. Future Picture was coined by the US Military for defining flight mission success, and was brought to business prominence in Air Force pilot James D. Murphy's 2005 book, Flawless Execution. Using his example of envisioning what success would look like, a bank’s Future Picture should be a detailed description of successful execution of strategy. I challenge bankers’ to describe their Future Picture. It can be highly subjective and difficult, particularly in an era of unprecedented change. But I would like to share three strategic directions where the train has either left the station, or is boarding. 1. Branches must be larger to survive. 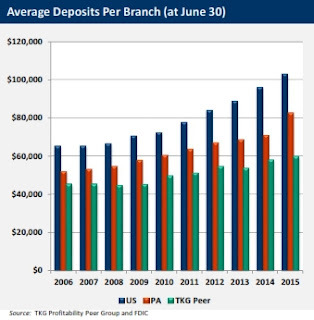 According to my firm’s profitability database, branches generated revenue (defined as consumer loan spreads, deposit spreads, and fees) as a percent of branch deposits of 3.50% in 2006. Today, that number is 2.08% due to the interest rate environment, the regulatory environment (reducing deposit fees), and customer behavioral changes. Therefore, the average deposit size of branches grew, to over $60 million at the end of 2015 (see chart). This trend is not likely to change, as bankers are more apt to prune their network and increase overall branch profitability. And the customer. Don’t forget them. They use branches less, although many still identify branch location as important to bank selection. 2. Technology expenditures will grow faster than overall expenditures. 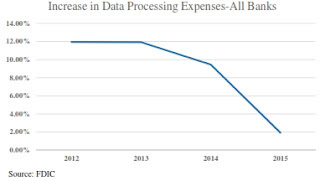 I recently performed this analysis for a client, identifying the “Data Processing” expense as a percent of total operating expenses for all FDIC insured banks as identified in their call report. Surprisingly, it represented only 4% of total operating expense. Note this excludes IT personnel expense. But the number is growing faster than overall operating expense (see chart), meaning that IT expense is becoming a larger proportion of operating expense. It is disappointing that this trend is slowing so banks can meet their budgets and profit objectives, regressing back to old habits of cutting IT projects to make budget. 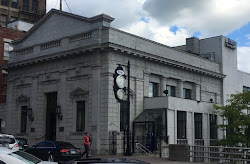 But overall, banks are seriously evaluating technology to improve efficiencies and their clients’ banking experience. 3. Robotics are coming. It was only recently I began to believe this. But there are opportunities being evaluated and implemented to automate repetitive processes to reduce overall costs, minimize risk, and speed the process. A couple examples where automation and/or robotics are ripe to improve processes include reviewing remote deposit checks, currently eye-balled by humans. Not scalable. The x-point evaluation could more quickly and effectively be accomplished by a robot. Another area where automation is coming is BSA case evaluation, where the bank’s BSA application identifies potentially high-risk client activity and a program goes through several standardized checks to clear the case or elevate it for human intervention, reducing the overall number of cases needing human review. These aren’t the only changes. Just the ones that I believe are coming, no matter who tries to stop them. So why try to stop them?